Storage might also go to the right here instead of stool. After the interest in my $800 1 Week No Skill Van Conversion, I got me thinking that there are more people out there who might be looking for an even faster, and less expensive, van conversion to get them on the road. Most people like to get started, and then upgrade their space as they find out more about what things work best for them. On forums, I see people burning a lot of time and money, or constantly struggling to save up the knot of cash for their dream conversion, only to find out they need to scrap it later as they figure out what they actually need. So why bother? You can spend a very small amount of money and get out on the road or more importantly, out from under your house bills. Ill show you how to do it in less than a single hour (delivery times not withstanding, though with amazon prime it would only take 2 days) and less than a paycheck. To be happy in this life style (and not quitting because you are miserable), at the very least you need a comfortable bed, a way to cook, a way to go potty, some light, and organization. Ill break down each of these. As with the previous No Skill Conversion, you won't need any tools or prior knowledge. Ill try to keep prices current and the cheapest option listed, so check back for updates if you have to. I've tested all these items for min. 2 weeks (often longer), or a very similar item (since i may update with a better/cheaper alternative). The best mattress I have found for the money is the Signature Sleep 8-Inch Memory Foam Mattress, Twin from Amazon. I've used this mattress for 2 years now, and it has held up exceptionally well. I am a very large man, and I still don't bottom out on it. 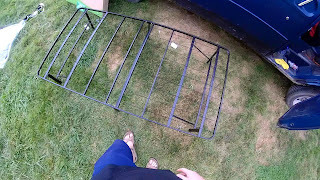 For the frame I selected the Sleep Master SmartBase Mattress Bed Frame from walmart. It is available from amazon if you need it delivered but its about 40 dollars cheaper through walmart. 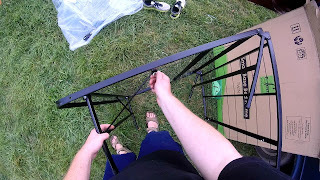 This bedframe is very light and assembles in about 2 minutes, you have to tighten 4 wing nuts with your fingers and you are done. I ordered and used this for 2 weeks, just for you! I was shocked at just how simple it was, and it has worked very well in my 2 week test. Some reviewers complained of noise, but I have not noticed an abundance, certainly not as much as some box springs I have owned. Still some room under and beside the bed. I've had this idea for a kitchen galley for a long time. Kitchen cabinets/counters can be very expensive, and very difficult to build yourself if you don't have the tools or know-how. I solved this problem with Whitmor 6256-978 Storage Cubes. 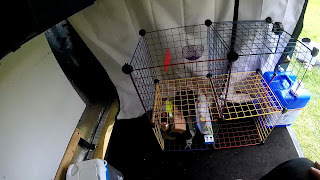 These little metal wire storage cubes are pretty neat, they use plastic connectors to assemble (just squeeze them on) and so you can customize the configuration to what you like. I chose the 4 cube set (kids set is same as regular, but cheaper, its just multicolored). Each cube is 15 inches. Update: If you can get milk crates free or cheaper, they can be used the same way, zip tied together. Assembled, and ready, takes minutes and elbow grease. You can leave the front side of a cube open for front access, or the top off to reach down in. The wire structure is very handy in general, you can clip bungees, caribiners, and items right to it. You can also make it even more secure with zip ties at the connections. The left cube I left the top off, to drop a Small Cooler inside. This allows me to open it from the top easily. The right cube has a top but the front face is left off, and an Reliance Products Aqua-Tainer 7 Gallon Rigid Water Container slides inside for our faucet. Secure it with a bungee. Ive driven this down ridiculously rough roads to test it, and despite the weight (and a slight bow to the cube bottom) it holds up fine even without zip ties, but if filling it i would use them. This video explains further. Don't fill all the way if you can help it, heavy! The sink is a simple dish pan from the local dollar store, not gonna bother linking it, just slide it in the cube beneath :) Pull the pan out under the faucet to catch water, remove the pan completely to toss grey water out. This is a good place to store dishes and frying pan/pot too. I also store some personal hygiene stuff here too, so its a bathroom sink and kitchen sink. The last cube you can leave the front off and stick food inside, or if you want to spend an extra 6 dollars get a cloth cube drawer as pictured here. Although you can do most of your cooking over the campfire, some times you might be restricted from doing so. For a stove I chose the smallest and cheapest type, a butane stove. They are pretty much all very similar, so this Butane Stove is fine. Since these have little feet on em, I decided to cover the top right cube with corrugated plastic, which conveniently slots into the cubes plastic connectors. 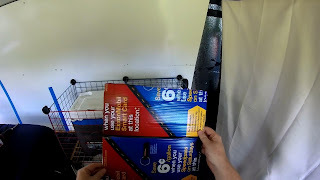 You can get this plastic for free, gas station signs (ask first!) and tons of election signs (after election) are made from them, just cut them and use the white side. I tested cooking inside with this setup. A word of caution, as with any flame you need to have ventilation and adequate space around and above it. 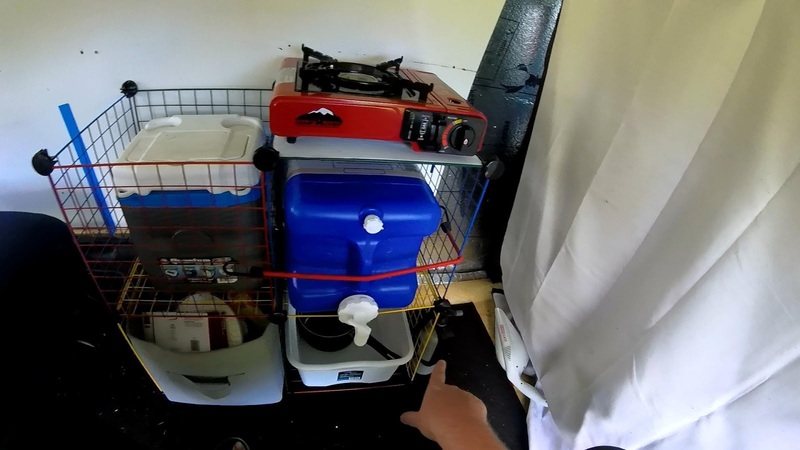 I have a roof vent that works, but since the stove is far from it and my van has a low ceiling, I have to keep an eye on it. I left the stove running for a while with nothing on it, and the paneling above was too hot to touch after about 10 minutes. So better to move the stove where it has ample room above it (floor or outside) or limit cooking times to a short duration. You might notice the fire extinguisher, I also have a carbon monoxide detector, and a wool fire blanket. I strap the stove to the cube top with another bungee for transport. Little drawers, 3 small baskets, clothes, and still more space. Under the bed is plenty of room for storage. It may be a little tough to get to, as you dont have much room left beside the bed frame to pull stuff out. I used several small containers I had on hand already and stuck them under in various ways, it worked out well. I think for clothing storage, Whitmor Jumbo Underbed Bags Zippered Java will work good. Each one should fit between the legs, and can be partially pulled out to get access. Of course with the bedframe, you can lift the bed up and reach through the frame too, one of the benefits of not having to have a box spring. Lots of storage back here, over/around the wheel well. 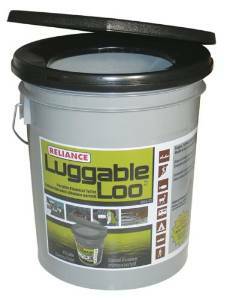 For the other organization aspects, just work in baskets and smaller containers where needed. 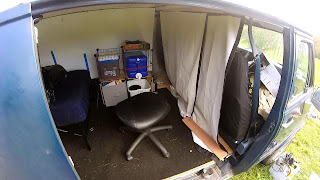 If you can squeeze it in there, a 3 drawer unit from wally world might work (in this setup, id put it against the curtain up front behind passenger seat where i originally had the cubes if i didnt want a chair/stool). Since the bed frame unfortunately does not fit over the wheel wells, you can still use that space behind the bed to great effect. 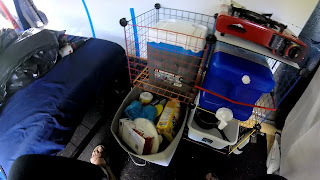 Throw long storage items back there like duffel bag for dirty clothes, folding camp chair, tire change gear, tent etc. 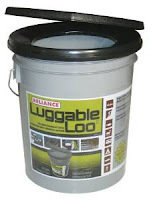 Reliance Products Luggable Loo Portable 5 Gallon Toilet does the trick and its the cheapest, beyond just using public restrooms (recommended). A lot of reviews and info on this out there, so not gonna rehash. You can find lots of cheap or free showers out there, use your sink for a "bird bath", or if you want to spend a little more grab a $8 solar shower. Easy to overlook, but it just takes one night to realize you need it. I keep a ton of cheap led flashlights on hand (check the tractor supply store bargain bin), but tap lights are a great way to have more 'permanent' house lighting. The Fulcrum 30010-301 LED Battery-Operated Stick-On Tap Light, Silver, 3 Pack, should do fine, stick one near the front, on the ceiling above the bed right in the middle of van, and one a back door. This should come out to right around 320 dollars, maybe a littlemore r less depending on when you read this. Some carpet from walmart ($20) and privacy curtains ($12) could tie it together. 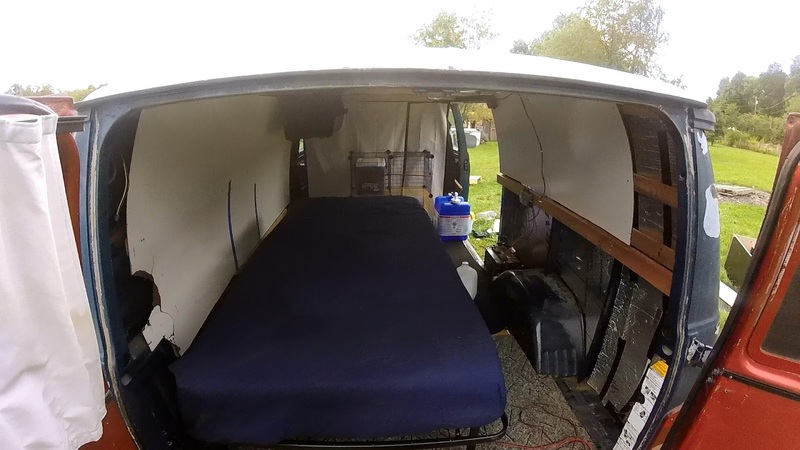 Of course you can add on or modify this forever by spending a little more (on electrical system for instance...) or even a little less (a good air mattress might save some cash....), but I hope that this conversion will provide a fast, inexpensive base to build your van dwelling life on. PS: I think another good alternative to the cube galley is a desk (which i mention in the other conversion), which can serve its intended function and the role of kitchen counter and food storage. However, it costs a little more for a walmart or ikea desk, which is junk in the long run (painted particle board). I speak from experience, after a while it falls apart. A nicer built desk would work good, but cost ya. PPS: Also, if your in cold weather, and unable to move with the seasons, a Mr Buddy heater and insulation are a must. You know, this post is awesome. You showed exactly what is needed to get out on the road. $320. I had no idea how cheap a complete set up could be. 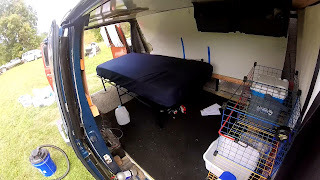 This is the kind of stuff I look for in van dweller blogs and videos. Thanks! Thanks! Hope it helps out! Sorru about that, it can be found at http://www.vanlifecrisis.com/2014/12/van-life-crisis-1-week-no-skill-van.html the blog got mixed up when i renamed the post a while back. Awesome post! The youtube link took me to invalid request? Was that meant to say a channel is coming? seems the subscription link wasnt working, i replaced it with a link to my channel instead, where you can hit the subscribe button manually. Thanks for the heads up! Thanks!! will check it out. This is a very well thought-out blog post. Thank you! Thanks a lot! I hope it can help someone! 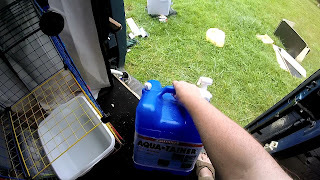 I use the 5 gallon bucket in my van for emergencies as well. However, keep some cat litter that you leave at the bottom of your bag and throw some on top when you're done. Turns everything into a solid and eliminates the smell. I use cat litter as well, i think arm and hammer double duty works the best. Ive considered switching to saw dust recently tho, as i have access to it here. Free is good and it supposedly works well enough. The storage cubes can be replaced with milk crates zip tied together in similar configuration if you can get the free or cheaper! An alternative but similar setup that I have uses a metal framed futon sofa/bed, which I got the frame for free off Craigslist, and added the 4" foam camping pads to it for the cushions at $19 each, wrapped in cheap washable flannel sheets for covers. 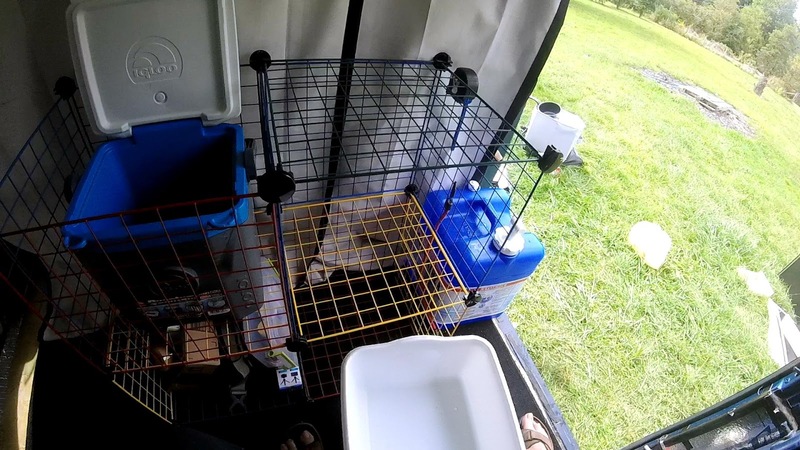 Instead of the wire crates, I have two sets of the plastic drawers side by side with a wood shelf over the top for added durability. Makes a great multi use counter top. A nice high back tilt/swivel desk chair makes for a very comfortable work or lounging chair. A TV tray makes a perfect desk/table that can be used either inside or outside too. Over the years I have become a huge fan of cheap, simple, and portable. Window vans for the sake of stealth, the view, the safety of being able to see whats going on around you in all directions, and the ventilation. 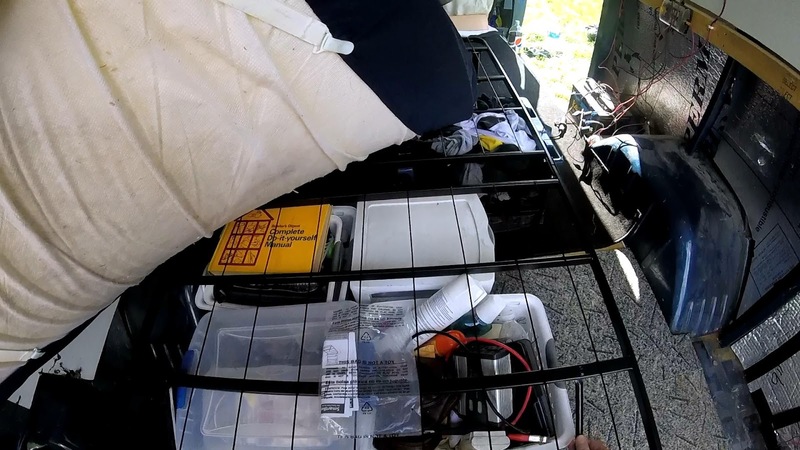 A super simple house battery in a marine style battery box with a multi outlet accessory port attached to the outside, and a jumper cable to the dash accessory outlet to charge it when driving. All of these things can be so simple, easy, and cheap that it totally floors me that so many people choose complicated and expensive only to wind up with set ups that aren't as comfortable, practical, or reliable. 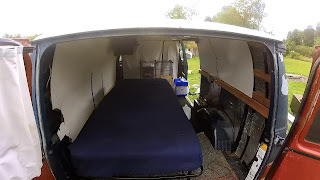 I think I have under $200 in my current setup, plus $800 for the van, and it is the most comfortable I have ever been, and it is certainly the most convenient setup I have ever had, with plenty of storage and no moisture problems caused by unnecessary insulation. I have discovered that older, pre-computerized, passenger vans are more reliable, and get considerably better gas mileage than cargo vans, and are usually also in much better shape. Unlike roof vents, the bottom opening tilt out windows in passenger vans can be left open in the rain too, and a <$20 12 volt fan from walmart is every bit as effective in a window as an expensive roof vent with a fan. I have also discovered that you can get cheap batteries from wrecking yards, both regular and deep cycle, and either seems to work equally as well, with the main difference being that the non deep cycle batteries seem to last a couple of years longer. My power needs are minimal, your results could vary if your setup is more power hungry. I also tend to charge all of my rechargeables at the same time I'm charging my house battery while driving. This gives me one extra free charge on everything without needing my house battery for it. I was never very happy with the more complicated setups, something hard to find and/or expensive was always in need of repair or replacement. Now I can replace almost anything pretty much anywhere, and frequently at a dollar store. Peace of mind is priceless.